Hi, i'm John Waring and I'm the owner operator of Johnny's Sport Fishing. I've lived in Chilliwack British Columbia my whole life and been fishing this area since I was 5 years old. My entire life, since the age of five has revolved around fishing, from Trout to Salmon to Sturgeon and everything in between. My dad used to drive me all around and sit in the car and read while I fished. Everything I have learned, it's from a lifetime of trial and error. I have been a full-time fishing guide since 1997 so I would say I definitely have my 10,000 hours. Over the years I've gained a vast amount of experience that has helped me to become one of the most consistent producing Sturgeon Fishing Guides in the area. I don't have a day job, this is my job. Even on my days off, I still head out to the river to go fishing. Quite simply, it could be no other way. I love meeting new people I'm making new friends, and showing people how to catch fish. After all these years, I'm still grateful for every day spent on the water with new friends. Each day brings new experiences and providing people with these experiences is what drives me each and every day. I believe there's no such thing as strangers, only friends I haven't met yet. Why book with Johnny's Sport Fishing? • Custom built rods for giant Sturgeon! Check out our Fishing Report to get caught up on the latest river conditions and highlights from our recent trips! Me and some friends had a weekend fishing getaway from Alberta. Well worth the trip as John had us on some real good monster Sturgeon. He is a very easy going guy and has a great boat so no worries about breaking down. Also knows the fish in the area and where they hide. It’s going to be a yearly trip only with Johnny’s Sport Fishing, the best Sturgeon Fishing Guide on the Fraser River. Thanks John! We had a great days fishing with Johnny. His expertise and determination resulted in a fantastic sturgeon at the end of the day to add to the others caught in the morning. 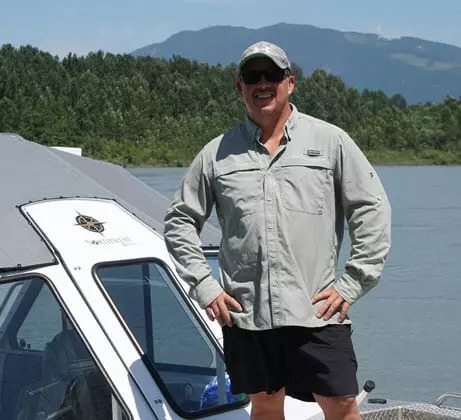 John is a great guy who puts you at ease and is also tremendously knowledgeable about both the Fraser River Sturgeon and the local area. If you want some fantastic Sturgeon fishing in the company of a good guide then look no further. As a beginner I needed a lot of guidance. Johnny was so super patient and gave me superb guidance while still allowing me to learn. Also, he knew all the best spots because he grew up around the Fraser River area. Plus the day was so fun! Would definitely recommend Johnny as your Fraser River Sturgeon fishing guide! With over 20 years experience fishing for trophy Fraser River Sturgeon, we will provide a world class professional fishing experience. From beginner to expert, our professional, experienced guides will work with you to help you catch your giant sturgeon. From single anglers to families with children, to large corporate groups, we can take care of it all. In all honesty, our guides want you to catch a fish more than you do, and work hard to deliver.